Indulge me for a minute, while I take you back to the turn of a decade. The decade. 1980. A nine-year-old girl (me) runs downstairs on Christmas morning in search of presents and sees the absolute coolest thing ever. A stereo system, with a radio dial that glows blue and a cassette deck and a turntable! That can’t be for me, she thinks. But it was for her. My first, very own stereo! Along with my first record album, Billy Joel’s Glass Houses (featuring “You May Be Right” and “It’s Still Rock and Roll to Me”- you remember, don’t you?)! The stereo would be in my room, away from my pesty brother, for my use only, and I’d get to grow an album collection to rival my father’s. Nineteen-eighty turned into 1981, then 1982. Hair got bigger, fluorescent accessories became the fashion, girls’ eyes decorated with silver eyeliner sparkled at boys in Members Only jackets and parachute pants. Through the heart of the eighties, I collected the Grease soundtrack, Donna Summers’s On the Radio, Michael Jackson’s Thriller, Whitney Houston’s Whitney album, and tons more. My collection grew and grew into a wondrous sampling of eighties music at its finest. I also loved to listen to the radio. However, with the invention of the Walkman, I needed to get my favorite songs from the radio onto blank cassette tapes so I could enjoy them anywhere on demand. Let me tell you this, young ‘uns. There was no iTunes back in the eighties. There were no “playlists,” and dragging and copying songs on the computer, and burning CDs. In order to buy music we needed a parent willing to pay for it and willing to actually drive us to a store. And, we weren’t allowed to go to the record store to buy whole albums when we were looking for one song. Sometimes we’d even have to wait until our birthdays to get the latest album. Can you fathom that? So what did we do to make a mix tape to listen to in our Walkman or give to a love interest, you wonder? We sat in front of the radio, for hours, listening to each song, waiting for the one we wanted to hear. If you knew your song was popular, you could wait for it to be played during a countdown. If it hadn’t yet made the charts, it could take days, hours, weeks, to hear your song! Your timing had to be just right. If you were station-surfing with the big giant round knob that you actually had to adjust to get proper reception, and you missed your song being played on another station, you were s*it out of luck. And when your song finally came on, you had to make sure your cassette was ready at just the right spot in the tape, then hit Record and Play to tape your song. It wasn’t easy, folks. 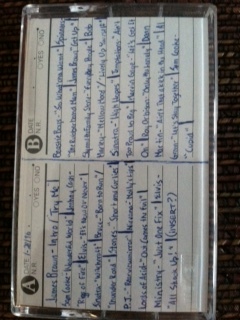 Making a mix tape back in the day was more of a talent. Like a prisoner on lockdown I’d be stuck in my room while I waited for songs from Duran Duran, or Culture Club, or Men Without Hats, or any of the other awesome 80’s bands that I wanted to record on my blank cassette tapes to listen to in my Walkman. Most times, the beginning of your taped song was overcome with D.J. chatter, and the end was cut off. And, when your tape was complete, unless you had thought to use the counter on the stereo and record the placement of the songs on the tape, you had to fast forward and rewind your cassette tape a gazillion times to find the song you were looking for. Being a music fan back in the old days took commitment and dedication. In the age of iTunes, the mix tape has lost its luster. How do boyfriends show girlfriends the extent of their love nowadays, when it’s so easy to order songs and compile playlists in a matter of minutes? I’m sounding like the old lady who walked to school uphill, both ways, in the snow. Which humbly brings me to a more serious point. My nine-year-old son JC recently told me that he wanted to invent a new type of television. One that didn’t need a remote. You could just talk to the television, and say “Switch to Channel 5,” or “Volume up” or whatever you wanted to do. I think about it further and picture JC as a forty-year-old dad–a famous inventor of wonderful things– sitting in a recliner listening to his kids complain about who gets to pick the voice-activated channel for the night. And I envision him saying something along the lines of: “You kids, quit your complaining! Back in my day, we actually had to find a remote and press buttons to change channels! Argh!” (I add the “Argh!” because he’ll be grumpy having to deal with the kids). Things keep changing and each generation thinks they have more character and stamina and experience than the next because they had it tougher. They didn’t have the same technologies and conveniences. Whether it’s my grandmother telling me the difficulties of washing cloth diapers without a washing machine, or my mother being tied to the wall by the telephone wire, or me explaining the magic of mix tapes, no matter how far things come, they always end up going farther. But no matter how easy things like that get, life seems to be getting more difficult. Kids are dealing with issues that we never had to deal with. They’re worried about on-line predators, practicing lock downs in school, learning about STDs. It seems that the simpler things get, the harder life gets. I think it’s important that we remember that being a kid isn’t easy, no matter what decade you grow up in. Let’s not morph into cranky old men and ladies. Let’s acknowledge and respect each generation’s challenges. What a great and wonderful story. This was a great way to start my day. Thanks for the nice comment! It made my day. Teachers should know better than to leave ancient artifacts lying around! Good parenting! Ha! Yes. You know how curious JC can be! Thank you! The effort it took made it special, I guess.